Under surveillance. Under suspicion. Under control. 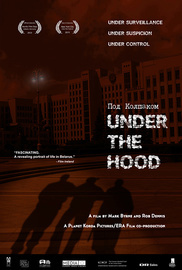 “Under the Hood” brings us on a journey through Belarus, where the secret police is still known as the KGB and gathering in public to do nothing is considered a crime. The film takes us from the protests and secret opposition meetings of the capital, Minsk, to the horse-drawn carts and hand-tilled fields of the countryside, following the lives of businessman Yuri, villager Lyudmila, opposition activist Franak and journalists Eduard and Viktor, among others. Their stories, of normality punctuated by bureaucracy and occasional brutality, remind us how close Belarus is to the rest of Europe – and how very far away.